All Web addresses mentioned were functional as of 12-2-16. From the Cumberland Gap to the Atlantic Ocean, this is Virginia Water Radio for the week of December 5, 2016. This week, that excerpt from a video created by Sgt. David Erskine of the South Carolina National Guard, opens our review of the 2016 Atlantic tropical storm season, which officially ended on November 30. The season in the Atlantic basin—including the Atlantic Ocean, Caribbean Sea, and Gulf of Mexico—officially begins June 1, but this year’s first storm formed in mid-January. Hurricane Matthew in late September and early October was the most powerful and destructive of this season’s 15 named Atlantic storms. It devastated Haiti, struck Cuba and the Bahamas, and then brought storm surge, strong winds, heavy rain, and flooding to the U.S. East Coast. Damage in Virginia led to federal disaster assistance in seven southeastern cities and two southeastern counties. For some insight into the kinds of responses a destructive hurricane can require, let’s have a listen for about 90 seconds to two people involved in responding to Matthew: first, a North Carolina National Guard member; and second, U.S. Coast Guard Rear Admiral Dan Abel, Director of Operations for the Southern Command. As destructive as Matthew was, it—of course—wasn’t the whole story of the 2016 Atlantic season. The 15 named storms included seven hurricanes and three major hurricanes, that is, Category 3 or above, a bit above the average annual numbers from 1981 to 2010. Five named storms made landfall in the United States, the most since six occurred in 2008. And the “accumulated cyclone energy” for 2016—combining strength and duration of storms—was about 40 percent above the 1981-2010 average, largely due to three relatively strong and long-lived storms: major hurricanes Matthew, Gaston, and Nicole. Thanks to the Defense Video and Imagery Distribution System for making this week’s sounds available for public use. And we close with a few more seconds of music from Sgt. Erskine’s Hurricane Matthew video. “South Carolina National Guard during Hurricane Matthew,” by Sgt. David Erskine, South Carolina National Guard, 10/25/16. North Carolina Guard responds to Hurricane Matthew, 10/13/16, by Staff Sgt. Brendan Stephens, North Carolina National Guard. “JTF-Matthew -- A SOUTHCOM story,” by Raymond Sarracino, U.S. Southern Command, Miami, Fla., 11/3/16. This was an interview with Rear Adm. Dan Abel, U.S. Coast Guard Director of Operations for the U.S. Southern Command (SOUTHCOM), who describes his command’s role in humanitarian operations in the Caribbean during Hurricane Matthew in October 2016. 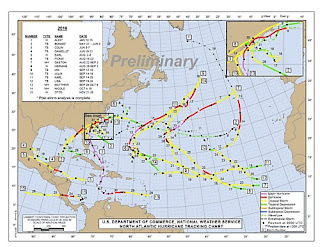 Hurricane Center’s graph of preliminary (subject to verification) tracks of Atlantic tropical storms and hurricanes in 2016, as of 12-1-16; accessed at http://www.nhc.noaa.gov/text/MIATWSAT.shtml. 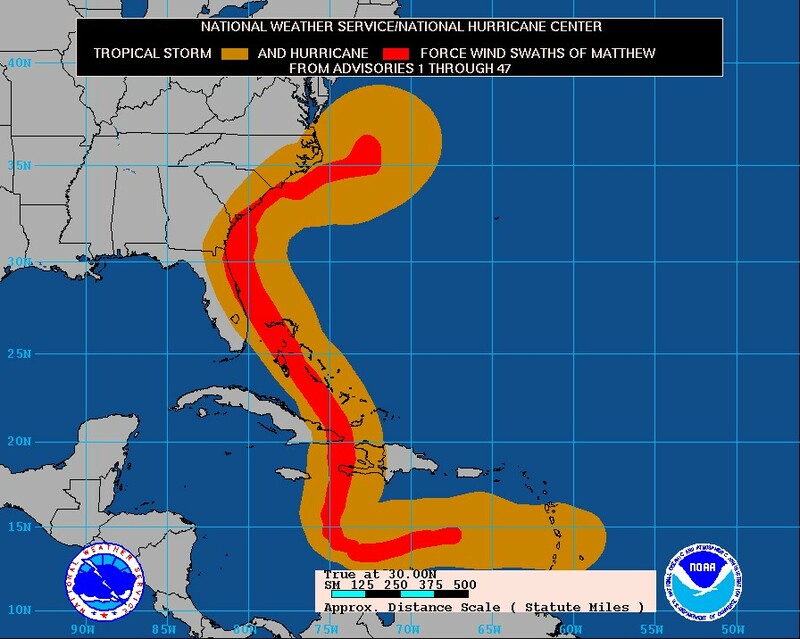 Cumulative wind history of Hurricane Matthew for 9/28/16 through 10/9/16 (period covered by Public Advisories 1 through 47). Graphic taken from the National Hurricane Center, online at http://www.nhc.noaa.gov/graphics_at4.shtml?5-daynl#contents, accessed 11/1/16, 8:00 a.m. EDT. 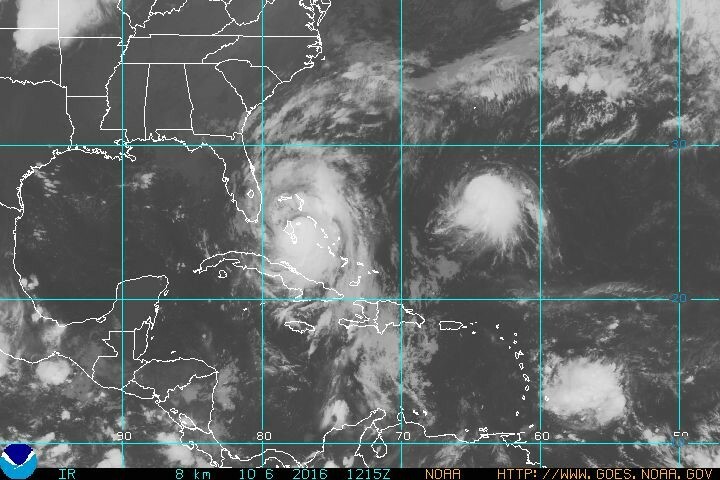 Hurricane Matthew (Category 3 at the time), centered over the Bahamas; and Tropical Storm Nicole in the Atlantic east of the Bahamas, 10/6/16, 8:15 a.m. EDT. Photo accessed at the National Oceanic and Atmospheric Administration (NOAA) Web site at http://www.goes.noaa.gov/browsh.html, on 10/6/16, 9:00 a.m. EDT. NOTE: Z, or Greenwich Mean Time, shown on the photo is 4 hours ahead of EDT and 5 hours ahead of EST. Source: National Hurricane Center, http://www.nhc.noaa.gov/data/tcr/index.php?season=2016&basin=atl. The average annual numbers of Atlantic tropical cyclones from 1981 to 2010 is 12 named storms, six hurricanes, and three major hurricanes. 2016 overall, according to the National Hurricane Center, was the first “above-normal” Atlantic tropical storm season since 2012. Source: National Hurricane Center news release, “First above-normal Atlantic hurricane season since 2012 produced five landfalling U.S. storms,” 11/30/16. Category 5 – wind speed ≥157 mph (252 km/hr. ; 137 knots); catastrophic damage will occur. Source: National Weather Service, “Tropical Weather,” part of “JetStream—An Online School for Weather,” online at http://www.srh.noaa.gov/srh/jetstream/tropics/tropics_intro.html. John Boyer, Several storms left their mark during 2016 hurricane season, Richmond Times-Dispatch, 11/30/16. National Hurricane Center, “Monthly Tropical Weather Summary,” 12/1/16, online at http://www.nhc.noaa.gov/text/MIATWSAT.shtml. National Hurricane Center news release, “First above-normal Atlantic hurricane season since 2012 produced five landfalling U.S. storms,” 11/30/16. Governor McAuliffe Announces Federal Disaster Assistance for State and Local Governments Impacted by Hurricane Matthew, 11/17/16. National Hurricane Center briefing podcasts, available online at http://www.nhc.noaa.gov/audio/. National Weather Service, “Tropical Weather,” part of “JetStream—An Online School for Weather,” online at http://www.srh.noaa.gov/srh/jetstream/tropics/tropics_intro.html. This site has information on the history and science of tropical storms. The main JetStream site, at http://www.srh.noaa.gov/srh/jetstream/index.html, has information about many other weather topics, too. Virginia Water Central News Grouper tropical storm posts, available online at https://vawatercentralnewsgrouper.wordpress.com/?s=tropical+storm. All Water Radio episodes are listed by category at the Index link (http://www.virginiawaterradio.org/p/index.html); see particularly the “Weather/Natural Disasters” subject category. Annual season-preview episodes: Episode 163 - 5/27/13, Episode 215 - 5/26/14, Episode 266 - 5/18/15, Episode 317 - 5/23/16. Mid-season outlook: Episode 330 - 8/22/16. Storm surge threat: Episode 134 - 10/29/12 (during Hurricane Sandy); Episode 337 - 10/10/16 (during Hurricane Matthew). 2.7 – Weather and seasonal changes affecting plants and animals. 3.9 – Water cycle, including sources of water, energy driving water cycle, water essential for living things, and water limitations and conservation. 2.6 – identification of common storms and other weather phenomena. 5.6 – characteristics of the ocean environment. 6.6 – structure and dynamics of Earth’s atmosphere. LS. 10 - changes over time in ecosystems, communities, and populations, and factors affecting those changes, including climate changes and catastrophic disturbances. ES.10 – ocean processes, interactions, and policies affecting coastal zones, including Chesapeake Bay. ES.11 – origin, evolution, and dynamics of the atmosphere, including human influences on climate. CE.7 – government at the state level. CE.8 – government at the local level. CE.9 – public policy at local, state, and national levels. WG.2 - how selected physical and ecological processes shape the Earth’s surface, including how humans influence their environment and are influenced by it. WG.10 - cooperation among political jurisdictions to solve problems and settle disputes. GOVT.8 – state and local government organization and powers. GOVT.9 – public policy at local, state, and national levels. CE.10 – public policy at local, state, and national levels. WG.4 - types and significance of natural, human, and capital resources. WG.18 - cooperation among political jurisdictions to solve problems and settle disputes.